NOTE: This project is outdated and may be insecure or incompatible with more recent versions of GPG. 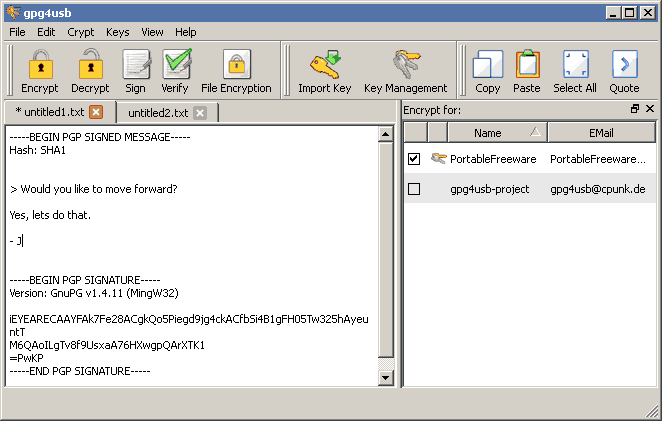 gpg4usb is a basic, tabbed notepad tool with easy-to-use text and file encryption tools. Using the Gnu Privacy Guard (GPG) security system means you can exchange encrypted text and files with someone you've never met, where most programs require a communicated password. Additionally, users can digitally "sign" and verify information to help establish integrity, ownership, or agreement. Users need only exchange a "public key" with one another in order to communicate. New users will need to generate a key, while users of other compatible software can import their existing keys. Functional in Linux (see How to Extract). GPG is a compatible, open source alternative to commercial PGP. How to extract: Download the ZIP package and extract to a folder of your choice. Launch start_windows.exe. Linux users: Download the same package and run start_linux_32bit or start_linux_64bit. Updated the included GnuPG-binaries from 1.4.18 to 1.4.20 (Announcement GnuPG 1.4.19 and Announcement GnuPG 1.4.20). In the last week we integrated 4 new languages. @procyon: Thanks for the hint, we've put it on our bug list and already located the appropriate line in source, which causes this bug. So this will be fixed in the next release. @mixture: We weren't sure, if we should integrate this, because it could confuse beginners, who read in other tutorials, that the should use the maximum keysize possible. Would be great, if you write your opinion to our mailing list. In fact we're not sure, if we should reduce the maximum key size again to 8192 (which is the maximum key size of any other gpg program We know). 0.3.2-1 generates safer gnupg-keys by default, with RSA and 1024bit minimum. Including gpg binary was updated to version 1.4.12. This release additionally contains binaries for MacOS. But since we had to rewrite the whole core, this release needs a lot of testing. So, if you want to be sure, better get the stable release. If you want to have a look what is planned for the release when it is finished have a look on our TODO-List. Can't find what you are looking for? This list shows entries with Files - Integrity Checkers as a supplementary function. You can view more entries with Files - Integrity Checkers as a primary function.